Timing is everything. 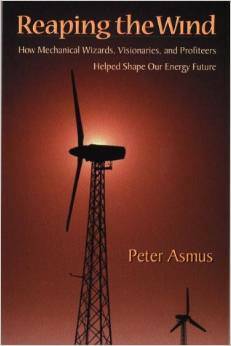 And Peter Asmus couldn't have better timed the release of his book about the rise and fall of California's wind industry. Just as California entered its first rolling blackouts this spring, Reaping the Wind (Island Press) entered distribution. The book sings the praises of California's hitherto unsung energy heroes, the men and women who made the sometimes faulty technology work in the state's windy passes. California-bashers will enjoy the eccentrics that made the pioneering days so colorful. A novelist would be hard pressed to create the cast of characters that Asmus assembles. His tale is replete with Zen Buddhists, Jungian dreamers, and a host of crooks, charlatans, and hucksters that swarmed to California's lucrative subsidies, like bees to honey. George Wagner is one such character. Wagner, a past president of the Jung Institute, saw the design for a wind turbine in a vision. He's been pursuing his dream ever since. Asmus' book is comprehensive, well-documented, and packed with interviews he gathered over several years of research. It's likely that some of those he interviewed won't talk to him again. Reaping the Wind reveals the inner workings of Livermore's secretive U.S. Windpower and the "deal junkies" that drove it into the ground. U.S. Windpower grew rapidly into the world's largest wind company, and was later renamed Kenetech in a failed attempt to market itself internationally. Its collapse was equally spectacular when it fell victim to greed and an arrogance difficult to match among the hustlers who prowl America's corporate suites. When it closed its doors in the late 1990s, USW threw 400 Californians out of work and sent a shiver through the wind industry. The demise of U.S. Windpower also marked the end of California as a world center of wind development. The state that once boasted 90% of the world's wind energy now operates less than 10% of it. Since its heyday in the 1980s, California has become a wind energy backwater widely scorned for its legacy of poor environmental practices. Asmus describes how one engineer, William Heronemus, broke ranks with the U.S. Navy's embrace of nuclear energy. Concluding that schemes to lace Boston Harbor with submerged nuclear power plants were sheer folly, Heronemus proposed an equally outlandish alternative: fleets of offshore wind turbines. Heronemus was decried as an unrealistic dreamer. Nuclear faltered, and the all the kings' men couldn't put it back together again. Meanwhile, wind energy proved itself and Heronemus' vision has taken form in the shallow waters off Denmark. The question raised by Heronemus' abandonment of nuclear power touches upon a widespread fear in corporate America, that wind energy is not "real", as U.S. Vice President Cheney has said. As opposed to oil, gas, coal and nuclear, the "real" sources Cheney prefers, wind isn't manly enough to power America. This odd idea prevails among the oil-industry executives in the Bush administration. At a press conference announcing the administration's new energy policy, spokesman Ari Fleischer suggested that wind energy was beneath Americans and couldn't help to "preserve the American way of life". California's great "wind rush" was an exciting time. It's a good story that's waited to be told. Asmus tells it, warts and all. Reaping the Wind: How mechanical wizards, visionaries, and profiteers helped shape our energy future. Island Press. ISBN 1559637072. 6x9. Cloth, $24.95. 262 pages. 2001.